Be the first to share your favorite memory, photo or story of Stella Mary. This memorial page is dedicated for family, friends and future generations to celebrate the life of their loved one. 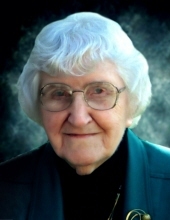 Stella Mary Timmons Hoggard Reifsnyder was born on November 17, 1919 to parents John and Mary (Beebe) Timmons. Raised with four brothers, Walter, Orville, Charles and Harold and three sisters, Arthella Hoggard, Nina Mangus and Olive Penney, who have all predeceased her, she grew up in the Merrill area. Mary married Anthony Hoggard on 12/25/1937 and together they had four children; Kay Beck, Ken Hoggard, Ginny Johnson and Keith Hoggard. She was a devoted mother and daughter, helping care for her parents, and Tony’s, at the end of their lives. Mary and Tony owned and operated Michigan Metals Company in Merrill for 10 years before retiring to lndian River. Always a devoted Christian, she and Tony were very instrumental in forming Trinity Wesleyan Church on Patterson Road in Midland where it is said that Tony would play guitar and he and Mary would lead singing. An excellent hostess who had the gift of hospitality, Mary was always inviting guests to her home after morning or evening church services for "lunches" which could have been a freshly killed and cooked chicken ae well as many other delicious meals she would create in no time. She believed strongly in her place in the home and supporting her husband, going through a difficult period when she was single again after a divorce in 1983. On 9/27/1986 Mary married Howard Reifsnyder, a widower, who predeceased her on 9/20/2012. They had been married just short of 27 years and the marriage was a blessing for them both. Howard's children from his first marriage, Carol (Bernard) Bailey, Debbie (David) Hughes, Dennis (Karen) Reifsnyder, and Kay (Roger) Emmons as well as their children and grandchildren mourn Mary's passing as she became very dear to them as well. Mary was an excellent example of a Christian life well-lived for her children, grandchildren (two of which, Michael Beck and Jeffrey Beck, predeceased her), and many great -grandchildren and great-great-grandchildren. One of her favorite songs includes the words, "The Lord has been so good to me; I feel like travelin' on"; she expressed often her readiness to move on to her enteral home and reunite with family gone before. She will be sorely missed by those who were privileged to have been loved and prayed for by her; her children, grand children, greatgrandchildren, and great-greatgrandchildren and many other friends and family members. Arrangements have been entrusted to the care of the Ware-Smith-Woolever Funeral Home in Midland with the Showing taking place on Tuesday evening from 4-7 p.m. Funeral and committal services will take place at 11:00 A.M. on Wednesday October 31, 2018 with visitation from 10:00 A.M. until the time of the service. Those planning an expression of sympathy are asked to consider the Alzheimers Association. To plant a tree in memory of Stella Mary Timmons Hoggard Reifsnyder, please visit our Tribute Store. "Email Address" would like to share the life celebration of Stella Mary Timmons Hoggard Reifsnyder. Click on the "link" to go to share a favorite memory or leave a condolence message for the family.